Our contributor wrote this piece in November 2017 as a response to the Sutherland Springs mass shooting. Approximately three months later, on February 14th, 2018, 17 people — students and staff — were killed by a mass shooter at Marjory Stoneman Douglas High School in Parkland, Florida. Approximately three months after that massacre, we are publishing this piece yet again. On May 18th, 2018, a gunman at Santa Fe High School in Galveston County, Texas murdered at least ten people — students and staff — as the school day began. 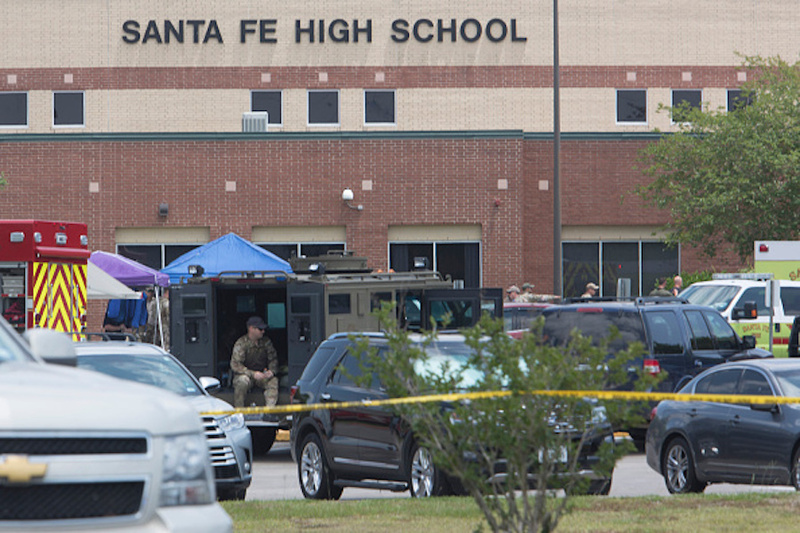 Reports state that at least 13 other people were hospitalized, and that the shooter — a male Santa Fe High student — is in custody. Following the school shooting in Texas, we see history repeating itself — again: A lack of gun control results in tragic and preventable loss of life — and politicians only offer thoughts and prayers. On Sunday, November 5th, inside the hallowed halls of the First Baptist Church in Sutherland Springs, Texas, a gunman opened fire, murdering at least 26 men, women, and children, and injuring 20 other people. It was the 377th time Americans have witnessed a mass shooting in 2017 alone, and comes just over a month after the horror in Las Vegas, which was the deadliest mass shooting in contemporary U.S. history. Predictably enough, American politicians and government officials have responded in the same tired fashion: by offering their “thoughts and prayers” to the victims of gun violence and their loved ones. Everyone from President Donald Trump, House Speaker Paul Ryan, and even Texas Governor Greg Abbott have shared the same empty sentiment without offering any real, concrete solutions to a problem that claims nearly 12,000 lives every year — and injures twice as many. It raises the question: How should we respond to people, including our elected officials, who think that “thoughts and prayers” are the solution to gun violence? Following Sunday’s tragedy and the unsurprising response out of Washington, Twitter users were quick to point out the cruel irony of the tired statement: the victims of this latest act of domestic terrorism were in church, literally engaged in prayer, when they were viciously attacked by a white man wielding a legal gun. Many people noted just how insensitive it was to offer nothing more than a well-rehearsed statement to a group of people who witnessed firsthand how little prayer can do to stop gun violence, even within the walls of their house of worship. 36 days of thoughts and prayers from Congress since the #LasVegasShooting obviously hasn't worked. We need gun reform NOW. The problem with thoughts and prayers is that they are passive. They may offer some comfort, but they provide absolutely zero action. We elect politicians to fix public policy problems, not pray for miraculous solutions. Our representatives are sent to Washington to work on behalf of the American people, to create laws and enact policies intended to keep the public safer. All too often, though, our elected officials respond to public health crises like gun violence and firearm-related deaths not with action — but with deflective statements that inevitably include their thoughts and prayers. These standardized statements serve as a shield, protecting politicians and policy makers from shouldering any of the blame for a system that allows for legal gun owners to open fire at a school, concert, and church congregation — a system they help create. “Thoughts and prayers” relieves them of their responsibility to actually take action in order to help prevent future incidents. By offering their thoughts and prayers to victims, politicians are implying that this tragedy — like the 376 tragedies before it this year — was the “inevitable” price we pay for our Second Amendment right. Thoughts and prayers are the kind of thing you send to sick children, patients with cancer, friends who have lost a loved one to old age or illness. They are meant to comfort people suffering from unavoidable or inexplicable tragedies. In the case of a mass shooting, something that has happened more times in 2017 than there are days in the year, reacting the same way makes the unfair (and untrue) assumption that the violent incident was inevitable. That troublesome phrase — especially when recited by politician after politician — tells victims, their loved ones, the attackers, and the American people that gun violence is out of the government’s control. Instead, it is in the control of a higher power that cruelly takes the lives of tens of thousands of Americans every year — and this ideology becomes even more absurd when you consider that we are supposed to have a separation of church and state. Moreover, thoughts and prayers let the blame fall on misfortune, tragedy, a cruel twist of fate — and not on the elected officials, the NRA, or the Big Gun industry that should be held accountable for their roles in America’s gun violence problem. Offering thoughts and prayers to victims of a horrifically common tragedy (that isn’t this common in any other country) implies that there is no next action beyond sorrow and empathy. It says, loudly and clearly, that Washington believes there is nothing that can be done except to share the tissues. Research in public policy, public health, gun ownership, and violence, however, begs to differ. According to experts from around the world, policies restricting firearms correlate with a reduction in firearm deaths. But no matter how many researchers, scientists, and policy experts discuss the need for new gun laws and restrictions, our representatives in Washington insist: A tragedy’s aftermath is not the time to talk about gun control. Instead, they lean on “thoughts and their prayers” to get America through the current gun-related tragedy before the next incident occurs. Thoughts and prayers are a great place to start, but from there, American politicians and policymakers — as well as the American public — need to build off their empathy towards real and meaningful action. While they’re sharing their usual thoughts and prayers, they should consider what exactly they are sending. Simple sympathy isn’t enough, and it never will be when there are concrete steps that can be made to save actual lives. Politicians’ prayers need to be aimed at their fellow lawmakers to enact change. Their thoughts need to be about meaningful policy changes that could prevent another murder, another death, another heartbreaking act of violence. Their tweets, public statements, and news sound bites offering their condolences must be the beginning, not the end, of the conversation. There is nothing wrong with offering sympathy, showing your empathy, and sending thoughts and prayers to victims of violence. That is, if you’re actually going to do something to make sure you never have to think those thoughts or say those prayers again.